So a few days ago, a question about Bash popped up, asking for a definition for it. The question seemed rather unclear, and a little lazy, but I decided to answer it. (I didn't realize it was a duplicate, and I didn't really think it would be one.) 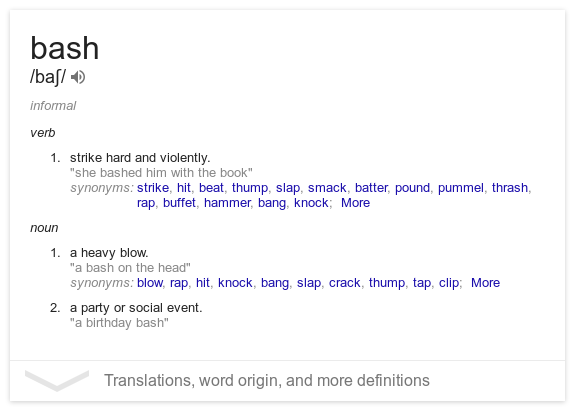 I looked up the word bash, and Google gave me a nice definition, which I copied and pasted into an answer, with a suggestion to Google what something is before asking a question about it. A few minutes after I posted it, a user (I wont say their name) commented saying they had downvoted my answer because, as they (somewhat) put it, "a 5k user should know better." I asked about what they meant, and they said that I shouldn't "encourage this type of question" by answering it, and that was the reason for the downvote. The rest of the discussion (I felt) was mostly aggressive messages from this user to me, and me trying to respond without losing it. (There was another user, but they were much calmer about their shared opinion.) I know I handled this badly, and should definitely have pointed this out to a mod. If any mod decides to look at this question, take a look at the deleted comments (that's possible I hope). However, this question isn't about who was the meanest person. The OP later commented and said that they hadn't understood the definition given by Google, and that was their reason for asking. So at least they had done some research. I feel this somewhat invalidates the unnamed users' argument that the OP was lazy about research, but again, that isn't so much the question (sorry for the long-windedness of this). I edited my answer and the question so that the Q&A resembled what it was supposed to be. Now, finally, the question. If someone asks a question that is very easily searchable with Google, and doesn't seem to have done any research, should this question be "encouraged" (answered)? Should I avoid this in the future? Should I be a little more careful? I know most answers I have made are based on research, so I'm not completely sure. Or, Should I answer but suggest that, in the future, the OP actually does a little research before asking? The question was okay (but duplicate). Answering an okay, not obviously duplicate, question is encouraged. I get a bit fed up of Team "Ermagerd just Google it" at times. While there are legitimate cases where I feel like head-butting a pony because they would get a result faster from Google (ie "What is Ubuntu"), many technical questions that are ohsoobvious to us, just aren't to normal people. If you ask our search the same thing, you get a load of complex technical questions about things in Bash. And while in both cases you can eventually dig up a meaning, the first glance result is a load of overwhelmingly complicated or conflicting data. If you don't know what Bash is, you probably don't understand that other terms like Unix are related to Ubuntu either. People can be a little unforgiving of beginners because they forget what it was like for them when they knew nothing. That is all to say: I have complete sympathy with somebody asking the question. You were also attacked in this process by somebody essentially claiming that answering stupid questions breeds more stupid. Or that as a more experienced user, you should implicitly know there's already an answer here for that question. You have already answered an exact duplicate "recently". You should probably remember it and suggest it as a close target. It's obviously and irreparably off-topic. And even then, there are cases where I've answered a question about a technically off-topic release or distribution where the answer would also apply to Ubuntu. Changing the question retroactively is okay as long as it still applies to the OP (explain that in your edit though). Googling the question in simple English returns a prominent answer on the site. You hadn't answered this before, it's clearly relevant, and even when you add "ask ubuntu" to the Google search, the results are muddy as hell. So I have complete sympathy with you too. Lastly, that people are blaming people answering for the quality of questions is ludicrous. If you don't like a question, deal with it in the way the site is supposed to deal with these questions: Improve it, ask the OP to improve it, close it, delete it, vote on it. Or some combination therein. If you have a specific issue, bring it to Meta. Comment threads very quickly that dissolve into people trying to pull rank to make a point. That was you too, Zach. It's not pretty. Help vampires are real but asking a bum question or two (which I maintain, this isn't), really doesn't form part of their definition. They are people who repeatedly ask bad questions. Dealing with these questions —as above— deals with these users. I don't really care how much research has been done, we are here to answer questions and any question that has not been asked before has value to the site. You could say that most questions on here lack research, as a lot of the answers can be found by Google but it would be silly to remove them all. Also, just because something can be found on Google does not mean the information is good, many sites have very poor formatting of code and explanations that were written by people who clearly did not know what they were writing about, as we specialize in this type of thing we should absorb this information in to accurate and well written answers. Sure, there are times when I think "This guy could of just typed that in to Google" but people come here for quick and accurate help, properly better help than using Google and just copying code they don't understand to a terminal with no explanation and here they can talk to some one and ask questions, we should all encourage people to stop copying random code from the Internet without understanding it, that is what we should be discouraging, come here for help, don't just copy crap from a five year old post, on some random site and then come here when it breaks your system. I don't know who told you "a 5k user should know better than to encourage this", IMO, they are wrong, they assumed a poorly written question lacked research but it turned out the OP had done some research (Google at least) and seems to me they just let there personal opinion get in the way of actually helping the user. In short, answer anything that is not off topic, as defined by the help section, if you think you can help, then help, if you find something that has not been answered here before (I know this one had but the dupe is not the point of your question) then it has value to the site, no matter how available the information is else where.